Iraq's autonomous Kurdistan Region has offered to "freeze" the result of September's referendum on independence and begin dialogue with Baghdad. 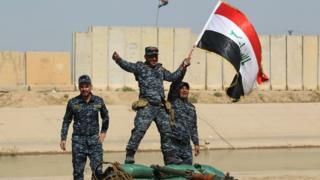 A statement also proposed a ceasefire "in order to prevent further violence and clashes" triggered by the launch of a Iraqi military operation last week. It saw troops and police retake control of disputed areas controlled by the Kurds since 2014, including Kirkuk. The Arab-led central government has yet to respond to the Kurdish offer. Prime Minister Haider al-Abadi has said the referendum, which saw people living in Kurdish-held areas overwhelmingly back secession, was illegal and has previously demanded that the result be annulled. Meanwhile, Iran has re-opened a crossing on its frontier with the Kurdistan Region that it closed after the referendum - something it also opposed. The Iraqi military's operation to retake the disputed areas, which were seized by Kurdish Peshmerga forces during the battle against so-called Islamic State, sparked clashes that left dozens dead and many more injured - including civilians. On Tuesday night, the Kurdistan Regional Government (KRG) said both sides were "obliged to act responsibly" in order to prevent further bloodshed. "Continued fighting does not lead any side to victory, but it will drive the country towards disarray and chaos, affecting all aspects of life," it warned. The KRG called for an immediate ceasefire and halt to all military operations. It said it was also prepared to "freeze the result of the referendum" and "start an open dialogue" with the government in Baghdad "on the basis of the constitution". There was no immediate comment from Prime Minister Abadi, but an MP close to him told the BBC that the Kurds should annul the result. Ali al-Alaq said that freezing the result would create a "time bomb" that the Kurdistan Region "could throw at the central government whenever it wishes". The Popular Mobilisation (Hashd al-Shaabi), a powerful paramilitary force dominated by Iranian-backed Shia Arab militias, also demanded an annulment. On Tuesday, Amnesty International said it had been told by displaced residents of the town of Tuz Khurmatu, south of Kirkuk, that members of the Popular Mobilisation and ethnic Turkmen fighters had looted, set on fire and destroyed hundreds of properties in predominantly Kurdish areas. The residents also reported that at least 11 civilians were killed in indiscriminate attacks involving mortars, rocket-propelled grenades and heavy machine-guns. Amnesty said it was unable to determine which parties were responsible. The UN has said almost 35,000 civilians have fled Tuz Khurmatu since 16 October.